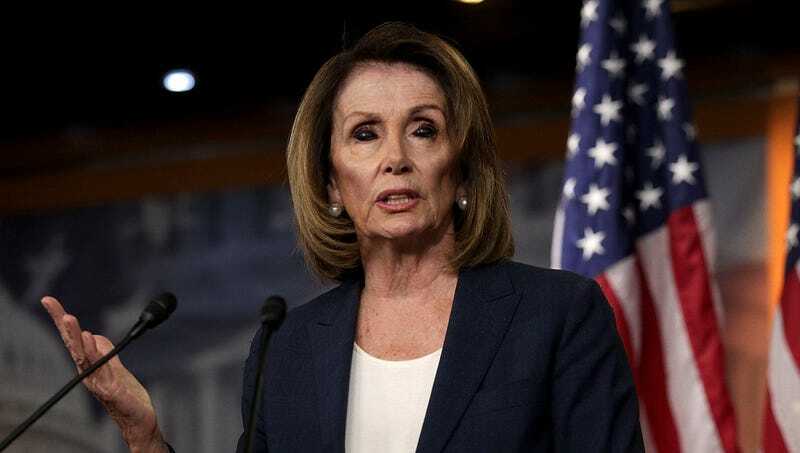 WASHINGTON—Expressing her excitement at the influx of newly elected progressives in Congress, Nancy Pelosi told reporters Wednesday of her plans to reenergize the House of Representatives by injecting herself with the blood of her party’s young members. “I’m really looking forward to improving the vitality of our caucus by spending lots of time with these new representatives as I slowly drain the blood from their shackled, unconscious bodies and then inject the precious liquid into my own veins,” said the current House minority leader, her eyes going completely black as she voiced her appreciation for the diverse wave of African American, Latino, Native American, and Muslim representatives, as well as for the “exquisite cocktail” of invigorating nutrients their blood would provide. “America sent a powerful message when they voted to send fresh blood to Capitol Hill, and I have heard them loud and clear. We’ve already collected 27 liters of plasma, and I pledge to use every last drop of it to renew my life force so that I can remain the top-ranking Democrat until 2075.” At press time, sources confirmed a newly spry Pelosi was on all fours frantically scrambling around the ceiling of the Capitol rotunda.